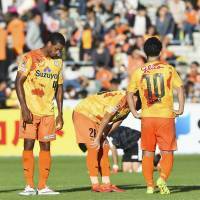 Shimizu S-Pulse’s proud uninterrupted record as a J. League first-division team came to an end last weekend, but after years of muddled leadership, the club has no one to blame but itself. 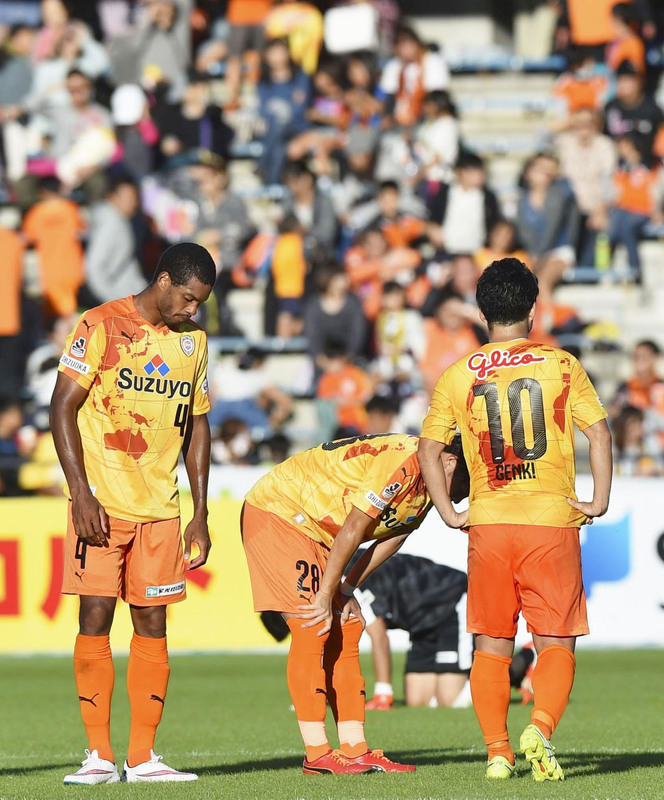 S-Pulse’s relegation was rubber-stamped by a 1-0 home defeat to Vegalta Sendai on Saturday, sending the Shizuoka side down to J2 for the first time in history. S-Pulse’s status as one of the J. League’s original 10 clubs — and the only one to grow out of a community rather than a corporation — lent a sadness to the occasion, but in truth it had been coming for some time. S-Pulse reached three cup finals in six years under former manager Kenta Hasegawa, but when he left at the end of the 2010 season, the club quickly unraveled. No fewer than 14 players followed Hasegawa out the door — including established internationals like Shinji Okazaki and Jungo Fujimoto — and the club began to flounder as it chopped and changed direction under new manager Afshin Ghotbi. Ghotbi was replaced by former player Katsumi Oenoki when S-Pulse found themselves in relegation trouble last season, but the club managed to avoid the drop on the final day. It was clear that the warning signs had gone unheeded when S-Pulse started this year’s campaign in abject fashion, however, and the replacement of Oenoki with Tasaka in August arrived too late to prevent the inevitable. S-Pulse’s relegation now means only three of the J. League’s original clubs — Yokohama F. Marinos, Kashima Antlers and Nagoya Grampus — will have the distinction of being ever-present in the first division. Slipping out of that group will have damaged S-Pulse’s pride, but the club must now take a long, hard look in the mirror before it prepares for its debut campaign in the second division. Last weekend’s action saw two J. League legends reach the same milestone, with Yokohama F. Marinos defender Yuji Nakazawa and Gamba Osaka midfielder Yasuhito Endo both making their 500th J1 appearance. Only three other players in league history have reached the half-century mark — Seigo Narazaki, Teruyuki Ito and Nobuhisa Yamada — with the 35-year-old Endo becoming the youngest player to do so. “I’m thankful I haven’t had many injuries,” Endo, who made his debut in March 1998, said after Gamba’s 2-1 win over Urawa Reds. Nakazawa, meanwhile, marked his 500th game with a 2-1 win over Vissel Kobe. “If I could have scored from a corner, I would have enjoyed it even more,” said the 37-year-old, who made his league debut in March 1999. Questions were raised over Shonan Bellmare’s ability to stay in the first division this season, but last year’s second-division champions secured their survival with a 2-1 win away to FC Tokyo on Saturday. Bellmare racked up more than 100 points en route to last year’s J2 title, but the specter of the club’s 2009 and 2012 promotion campaigns — both of which were followed by immediate relegations — loomed large over Cho Kwi-jae’s side. But Bellmare confirmed their survival with a win at the same Ajinomoto Stadium where they were relegated two years ago, and cast aside, for now, their reputation as a yo-yo club. — Matsumoto Yamaga defender Hayuma Tanaka psyches himself up with his team five points adrift in the relegation places.